Dow Jones retreats 23 points in a tight range bound session amid uneasiness about the global economy continued to hang over the market and a light economic calendar gave investors little excuse to jump in. While the economy may not be headed for a double-dip recession, continued economic and political uncertainty ahead of midterm elections and new tax policies are making it hard for stocks to re-gain momentum. In addition, concerns about the health of the euro zone pressured investors’ sentiment on the back of austerity measure protests in Spain, Ireland and Brussels, coupled with news reports that Allied Irish Banks PLC may need an additional capital boost to protect it from future losses. Moody's downgraded Anglo Irish earlier this week. For Dow Jones, key economic data for the rest of this week are weekly jobless claims (tonight), September Chicago PMI (tonight), September ISM and consumer sentiment (tomorrow). 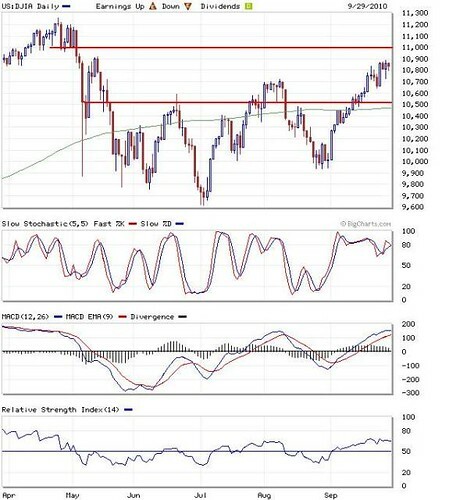 Immediate resistance targets are 10920 (May 12’s high) and Year-To-Date high of 11258 (April 26). Immediate supports are situated around 10500-10600 points. Daily Done Jones chart shows that it is likely to undergo range bound until the 3Q reporting seasons start in mid October.